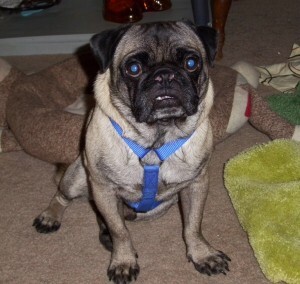 “Billie Joe (or BJ, as he prefers to be called) is a 3-year-old male pug released from a breeder in Nebraska. Since being taken into the rescue, BJ has been neutered and also underwent a “nose job” to improve his breathing. BJ is currently being fostered in Lincoln, Nebraska. A little shy at first, BJ is definitely warming up to his new foster mom, and enjoys the company of human companions. BJ immediately fell in love with his foster sister (also a pug) and almost never leaves her side. He regards his foster sister as the ultimate teacher of pug behavior, and takes her lead in every situation. BJ also loves to use her as a pillow, and shows his appreciation by showering her with kisses. But don’t worry—BJ’s foster mom is sure he won’t mind saying goodbye to his foster sister in exchange for a forever family! However, he would greatly prefer a home with at least one other canine playmate. BJ has done well interacting with dogs of various sizes, genders, and temperaments. BJ is starting to master the leash and is doing an amazing job with housebreaking. He always alerts his foster mom when he’s ready to go outside! He almost never feels the need to mark his territory (he has been wearing a belly band at times to curb his attempts during the adjustment period, but BJ thinks he’s more than ready to graduate from that silly contraption). His absolute favorite place in the house is the living room sofa. He’s pretty quiet and laidback, except when his arch-nemesis—the vacuum cleaner—makes an appearance. He’s looking for a forever family who can provide plenty of belly rubs (and maybe a nice couch to snuggle up on). If that sounds like you, please fill out an adoption application—BJ can’t wait to meet you! go for a few blocks which we will be able to add more once it starts to cool down. Not sure what we will do when it gets snowy and super cold. Him and Candy do well together, he likes to snuggle with her, which sometimes she will get up and move, I think she probably gets to hot. BJ (Left) with his foster sister. Ok, after some looking around I did find the info. on BJ! He is so adorable & I remember reading about him before. I’d love to meet him too.